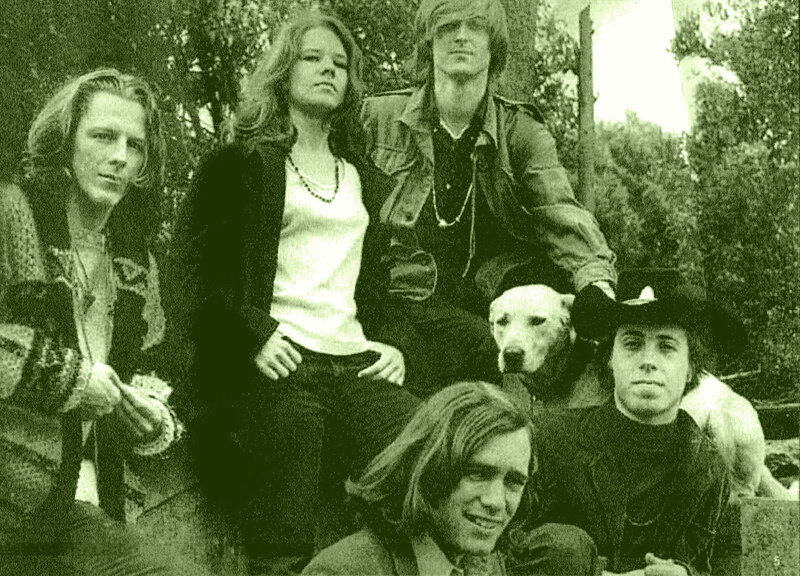 Big Brother & the Holding Company was a prime example of a band where the chemistry was right, where the whole was greater than the sum of its parts. THE HISTORY OF BIG BROTHER & THE HOLDING CO. I used to go on long walks through the city where every block seemed like a different chapter in a good book. One day I was walking down Page Street and speculating as to what family might have built a particularly fine Victorian house on the corner, when I heard someone playing the guitar on one of the upper floors. I walked boldly into the mansion which had seen better days and climbed the stairs to find a man playing in a large sunny room. It was Peter Albin who told me that he wanted to start a band that would write and sing songs for children. This seems remarkably prescient in him as that was exactly what we did. He meant it quite literally though since he had been working with children at Camp Meeker north of the city, and had written several songs for them. The song Caterpillar on our first album was one of those children’s songs. I liked Peter right away because he had a lunatic and unstudied way of looking at things and because he had a specific musical goal in mind. Peter was born under the sign of Gemini, the twins, and I have seldom seen a person so split in his orientation to the world. One of the twins in him is a timid Wally Cox-Woody Allen would-be businesslike person eager to gladhand the world and prove that he is normal, and the other half is the creative principle personified … all vivid terrifying imagination, naturally an artist, an artist almost against his will. Peter was studying photography when I met him and he later wrote a song called Light Is Faster Than Sound that I took as a photographer’s anthem when I began using a camera. Typically enough, he disavowed any deep meaning to the song, and especially any meaning that we apprehend the world through the eyes quicker than through the ears. This was the man that I found playing elemental blues that sunny day in the house on Page Street, an interesting old victorian home that had become a jewelbox full of human treasures. In every room there were people who were doing appealing and colorful art projects. I met Harold Wood, a juggler, acrobat and student of Hindu culture there. He and I were to play recorder together and we went through a lot of Bach and Telemann that summer. I met Jim Wilhelm there who played tenor guitar. When he sang Summertime he played an intriguing descending line on the instrument, an idea that I was to use later when Big Brother played the song. Each little chamber in the house, each little secret nook so exotically decorated and self contained, was a story all in itself. When the door of any room opened, a story unfolded that was unexpected and vivid. Visiting 1090 Page Street in San Francisco at that time was like attending a series of plays in a Magic Theatre for Madmen Only. The house had been built by the Dorman family who were fine furniture dealers in early San Francisco. Look magazine did a story on Irish Americans in the 1950s and mentioned that 1090 Page had become an Irish boarding house. The six very large bedrooms in the original plan had been made into 25. Later the house had come into the possession of Peter’s uncle Henry. It was a tax writeoff for him, but there was a catch. It had to be occupied. No problem. It was. There were many different stories in that house. There was a woman there named Donna who tried to bring me into Scientology. with me it didn’t take, but an old friend of mine is still a Scientologist as a result. There was Willie the Wizard, so called because he was always involved in mysterious chemical and electrical projects. I’m not sure just what he did (something involving computers and banks), but it must have been useful for him somehow as he is now a very wealthy man. There were film people who created stories and photographed them up and down the winding staircases, laughing and screaming with delight. We would often go up to the top floor of the house and recite poetry down the stairwell. I would often declaim the Middle English of Geoffrey Chaucer from the balustrade just to hear the sound as it careened down the three floors to the foyer of the old mansion. It was eerie for people who came in from the street because they could not tell where the resonant voices originated. Jim Sato lived there. He was an artist and anthropologist, a very quiet Zen man who painted beautifully. Once eleven of us from this house went in one car down to the Monterey Jazz Festival. Along the way we took some LSD and by the time we arrived I was laughing uncontrollably. Everything seemed so funny and so beautiful at the same time. I was laughing so loud that I scared the others who all melted away but Jim did not leave. He stayed with me and walked me around in the redwoods until I became a little less happy. He was the perfect guide for a psychedelic voyage in Big Sur. I often wondered what the original family who lived at 1090 Page would have thought if they could have come back to their home, the place where they saw their children grow up and where they buried their parents. What would they have thought of these new children who lived in exactly the same rooms but who were creating worlds so far removed from those of the San Francisco of the 1880s and 1890s? Down at the bottom of the house was the ghost of a beautiful old ballroom complete with proscenium arch that was a perfect rehearsal and dance space. Big Brother went through its early permutations there, changing names and personnel and being influenced by all of the magic currents that were flowing through the place. I had been writing music for most of my life but in the last year I had been composing in classical and rock styles and had a lot of material that I was eager to hear someone play. This house beckoned to me and seemed to offer a world of promise and enchantment. Chet Helms heard the same call. He began to organize dances in that Victorian ballroom around the sporadic and spontaneous rehearsals that Big Brother and other bands and theater people were having. Chet charged fifty cents to get in and these affairs were mildly successful. There were a lot of different kinds of people who carne, suburban folks from the “Avenues,” which is what San Franciscans called the Sunset and Richmond districts and also African Americans· from the immediate neighborhood. Here I first met Gary Duncan and re-met John Cipollina who later formed the Quicksilver Messenger Service. I played saxophone for a while with a band in Marin that John was in just after I arrived in the Bay Area from Okinawa where I went to high school. This old domicile, then, was Big Brother’s first home and we played here underground for six months or so until we had some kind of organized sound. Well, maybe “organized” is not quite the word. One of our early songs was called Bacon. As we were playing the tune, we set a hot plate on an amplifier and cooked bacon which was ready to eat by the end of the song. Very conceptual. James Gurley lived in another Victorian over on Pine Street and Chet brought him to play with us one lucky day. James grew up in Detroit and he came to San Francisco with his soon-to-be wife Nancy and 30 or 40 other Detroiters. Rita Bergman, Nancy’s friend and my shining star for a long time, was one of them. The Detroit people were very interesting and very involved in the early movement in San Francisco, and James was typical of them, artistic, committed, eccentric and bohemian. James, who came out of the folk scene, played the guitar with his fingers which was very unusual for rock players at that time. He played the guitar with his fingers up to and including his work on Cheap Thrills. James literally came out of the closet to play with us. He lived in a house that had so many people in it that when he needed to get away and practice the only private place he could find was a large closet. He had an old Martin guitar that he taped a stethoscope to, played his special music and was soon lost in his own world. He called himself the Archfiend of the Universe and wore black all the time. The Archfiend of the Universe came down to our ballroom rehearsals with that mahoghany Martin guitar, his wife Nancy and their dog Mischka. Mischka means little mouse in the Slavic languages, but Mischka had become a big dog, a big swaybacked German Shepherd. To receive your hippie badge in the sixties you had to have a big swaybacked German Shepherd. This was the inseparable trio who came to join Peter and me. Wherever James was, Nancy and Mischka were there too, and James was with us to stay. Now instead of a stethoscope he taped a pickup microphone to his acoustic guitar and played it that way for a long time until we made enough money for him to afford an electric guitar. In this music that we were creating I was trying to synthesize the new music with what had gone before, both classical and pop. James, however, jumped straight off into the unknown because he was a complete original. It is still the stage and the solos with him. Now in the 1990s James and I trade ideas every four measures or so in many of the solos we play, but then we couldn’t control ourselves enough to do that (it is still rather difficult). Whoever was taking the lead just played and played until he became tired and then the other would take over. Many times we just played melodies at the same time which made for a contrapuntal kind of sound … similar in texture (but not, of course, in content) to early music from New Orleans. Peter was playing bass now and James and I played guitar. We were having trouble finding a drummer who could drum hard enough and fast enough to play the kind of music we wanted. Then one day Dave Getz simply asked for the job. He was working as a cook at the Old spaghetti Factory and teaching at the San Francisco Art Institute where he had received a Masters in Fine Arts. For his undergraduate work he had attended Cooper Union in New York, a very good school indeed. In a certain sense Dave was the most agressive of us; he is the only one who would have asked to be in the band. He was painting in an abstract expressionist style around the time he joined Big Brother, and his canvases were huge. They covered entire walls. Big Brother needed what Dave brought to the band. He is the only one of us who had even the slightest business sense. James and I could have cared less and Peter wanted to be the businessman but he had no killer instinct. He would give you anything you asked for … no, he would give you things you never even thought of asking for. Dave brought an East Coast intelligence and urbanity to the band. He had an angelic face, a daffy sense of humor, and a manner that proclaimed him to be fair, impartial and understanding of how others could have different needs from himself. One of the things that I really liked about Dave was that he had an ethical sense and a moral purpose that was rare then (and now). He wore funny clothes though. And he was proud of them. Dave is always anxious to make a statement that he is not buying into any sort of attempt to be fashionable or hip. As a result his sartorial ensemble is often very entertaining indeed. Big Brother came out into the open on 22 January 1966 at a Trips Festival that had been organized by Ken Kesey. There had been a previous Festival that October in the Longshoreman’s Hall … odd place for psychedelic pranksters … and it had been quite magical. The Charlatans, the Jefferson Airplane and the Lovin’ Spoonful had played there and the Lovin’ Spoonful were particularly impressive. They put out a lot of energy and they were not afraid to smile and look as if they were enjoying themselves. Zal Yanofsky was obviously having the time of his life. He and John Sebastian were a good team. One of the distinctly unmagical things about the first Trips Festival, however, was Bill Graham. Or maybe one could say that his business sense was a sort of sorcery. Bill was with the San Francisco Mime Troupe before this. There was a conflagration that was going to cost them a lot of money and he put together a benefit to help them. It was his baptism of fire. He did the benefit so well that he was obviously the one to organize this Trips Festival. I struck sparks from him right away. He was in charge of the door and he let me in as a professional courtesy, but he said no to Chuck Jones, Big Brother’s first drummer who was standing right behind me. I had been watching Bill for a while and he seemed like some kind of monster to me especially in the context of all those soft hippie overtones that were floating through the air. We were creating the art and he was selling it.